Every month three comedians walk into Raffertys Theatre for a whole lot of funny business! Love blossoms with laughter, so this Valentine’s give the love of comedy to that special someone with Sydney Comedy Club’s top-rating (and rather hilarious) comedians from home and abroad! Peter Meisel is a New York City expatriate who has been living in Sydney for over 30 years. He moved to Australia to become a teacher but when he found all of his students laughing at him he started stand-up comedy. It been nearly 20 years now and Peter has performed on television, film, comedy clubs as well as his bedroom. And depending on whom you ask, he has made millions of people chuckle, guffaw, and chortle at him or with him. Thomas Orr has been a crowd favourite around Sydney for the last five years. He has hosted shows on Bondi Beach Radio, and runs the Bondi Comedy Club. He featured in the last two Sydney Fringe shows with One Crowded Hour. Peter Berner is without a doubt one of Australia’s most popular and respected comics and broadcasters, having performed his unique brand of comedy across Australia for nearly three decades and hosted iconic television shows and radio programs. Peter started his career as a stand-up comedian in 1988 and has performed at various prestigious festivals, including the Melbourne International Comedy Festival, the Sydney Comedy Festival, the Adelaide Comedy Festival and Just For Laughs – just to name a few. His intelligent humour has always set him apart as a performer who can comfortably straddle comedy styles as disparate as satire, observational comedy and reactive comedy with easy. Peter’s major TV hosting roles have been Backberner (1999-2002, ABC TV), The Australian Film Institute Awards (2004), The Einstein Factor (2004-2009, ABC TV), The Loaded Brush (2009, ABC TV), You Have Been Watching (2011, The Comedy Channel) and The B Team with Peter Berner (2016-2017, Sky News Live). Peter released his first book in 2015 titled The Book of He (Finch Publishing), which was a collection of original humorous illustrations about modern life from the perspective of a very ordinary man. Berner is set to shortly release its sequel, The Book of They (Finch Publishing) in September 2017. The Book of They is an 80-page look at relationships and coupledom, complete with Berner’s brand of observational comedy. 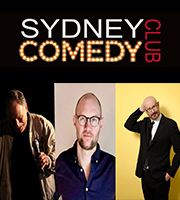 Sydney Comedy Club FEBRUARY line up! Going to the theatre doesn’t have to be serious business! Grab your friends, book your tickets and enjoy a hilarious night out at the theatre with Riverside’s monthly dose of comedy presented by Sydney Comedy Club! It just won’t be funny if you miss it!